The only thing I knew for certain about the doll was that I received it as a gift. My sister brought it back with her from a high school choir trip to New Orleans. It was a trinket really—a miniature jester wearing a leopard print costume, the face and hands made of porcelain. It wasn’t expensive, just a mass-produced souvenir. The heavy makeup on her painted face nearly tripled the size of her dark eyes. I had never liked clowns, never feared them either, so the doll was a strange thing for me to develop an attachment to. If she hadn’t been a gift from my sister, I never would have liked her much at all. Odd as she was, I kept her for years, always in a prominent place on my desk or bookshelf. I suppose after a while I simply stopped thinking of her as strange. Whenever anyone asked about her, I proudly told them of my sister thinking of me while away and bringing her back. I kept a number of art, trinkets, and toys on my bookshelves, mostly gifts from friends. That was where the doll sat since I first lived on my own. Despite being made of fragile porcelain, she survived four moves to and from college and three adult apartments. Occasionally, she would suffer an accident, when a cat or errant breeze pushed her off her perch, but she remained unharmed, now decades older and just as new as the day she arrived. Then my sister came to visit. 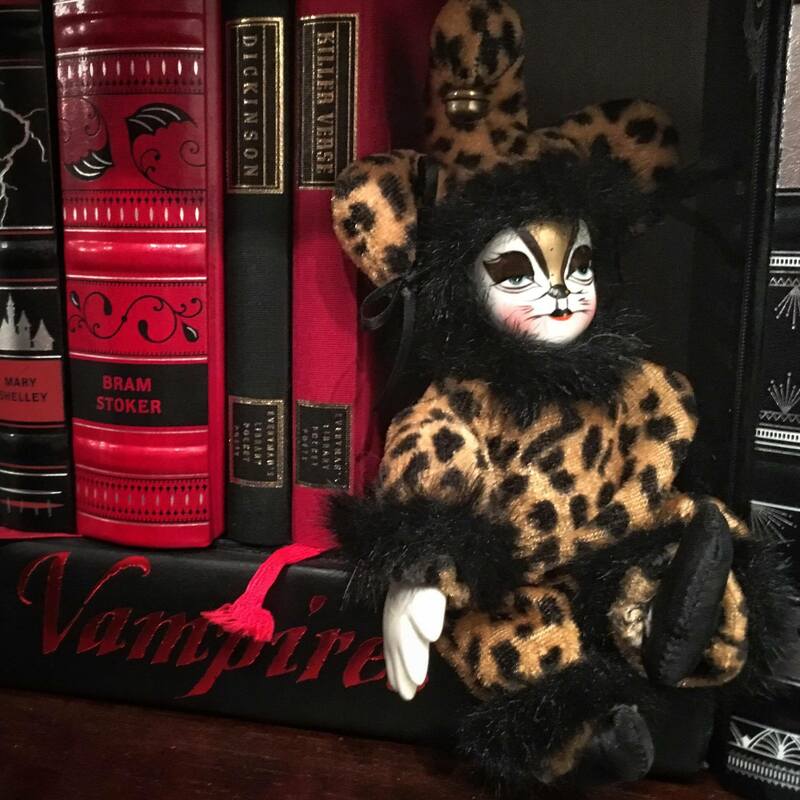 She could have been referring to anything (I own a number of things Wendy considered spooky, including my Ouija Board phone case), but was pointing at the doll on the shelf, where she sat guarding my reference books on vampire lore. “You bought it for me,” I said, with all the confidence I had from years of telling the story. I tried to remember. She had gone to New Orleans. She had brought back the doll. Those were facts, as secure in my mind as my own birthday. She had given me the doll… but when had that been? She must have been in high school, but then why did I remember the doll from before then? And why would Wendy, who was notoriously frightened by anything remotely occult, have gone somewhere in New Orleans that sold an item so strange? It was a mystery that, I’ve admitted to myself, was unlikely to ever be solved. And without the special honor that came from having been gifted by my sister, my decades-long attachment and care for the doll no longer made sense. The doll still sits on my shelves. I’m not one to get rid of a gift. And I am still certain that she was a gift, even if I don’t know who gave it.